More likely than not when young adults and Millennials begin their lives after college, they will be sharing a home with a roommate. Unlike in college when a dorm room and communal bathroom were all that were part of the co-housing experience, an apartment or house requires more than just storage bins and whiteboards. 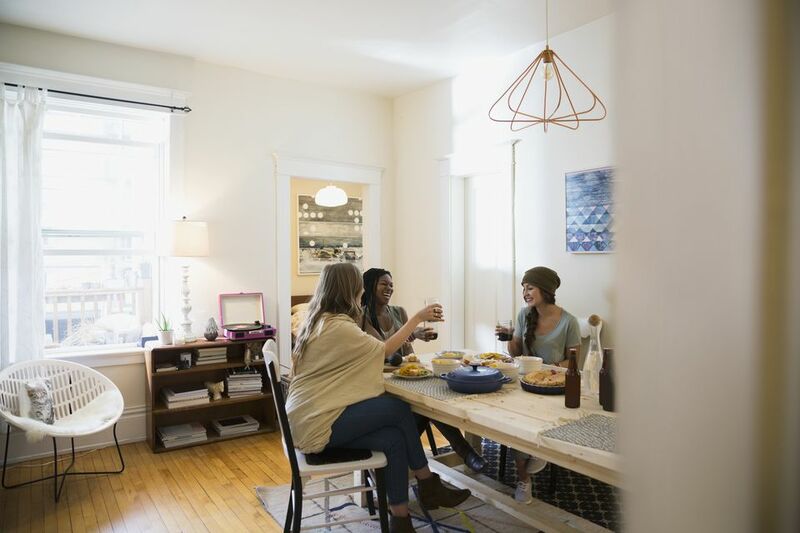 Setting up a home, whether with a long time friend or a new acquaintance can be costly and difficult, depending on the aesthetic preferences of the roommates. Finding a way to make a first home comfortable for everyone who lives in it will give roommates peace of mind and a nice place to come home to after a long day of work. If each roommate is fortunate enough to have their own bathroom, that's great—but if not, there are ways to make a communal bathroom for adults more user-friendly and sanitary. Agreeing to clean up after use is the first step—whether it means squeegeeing a glass shower door or swishing a toilet. Keep all of the cleaning supplies nearby so it's simple to take care of business as quickly as possible during the morning rush. If possible, keep personal products—makeup, hair care, etc - in individual bedrooms, and for women, setting up a vanity area in the bedroom will give privacy for daily care. Avoid having the same color towels, razors, toothbrushes, water cups and hairbrushes to keep straight what belongs to who. Purchasing different colored plastic bottles for each roommate for the shower and keeping soaps, shampoos, and conditioners in them will also help to keep things separate—and add a bit of organization to the space. Furnishing a living room can be challenging and expensive for newly-employed young adults. There's nothing wrong with asking family and friends if they have anything they are interested in getting rid of - offering to pick it up and take it away can be a big help, and chances are the purchase price, if any, will be minimal. While it's not possible for most Millennials to have an entirely new suite of furniture in their living rooms, some things are worth the investment. Anything that is upholstered—chairs, sofas—is worth buying new to ensure that it is clean and sanitary. If an upholstered item comes from family or friends, that's fine, but avoid buying these things from strangers or online, unless the furniture is going to be re-upholstered. While many young adults will end up eating take-out or leftovers sitting in front of the television, a proper table and chairs are useful to have for more than just dining. Eclectic and fun are the way to go for inexpensive but chic design. Dining tables can be found for a range of prices, and dining chairs can be picked up at garage sales, flea markets or second-hand stores. They don't have to match—in fact, it's more interesting if they don't. To keep things calm, paint all of the chairs the same color, no matter the design. Like upholstered furniture, mattresses should never be purchased second-hand from strangers, and even using old mattresses that family and friends offer can be questionable. If investing in one quality piece of furniture is all a young adult can afford, make it a mattress and boxspring. It doesn't have to be the best of the best, but brand new is key. Don't rush out and buy a headboard, either—lots of big, colorful pillows will work just as well. Good-quality sheets that are 100% cotton will only get more comfortable with washing. A good night's sleep is not negotiable—getting a proper bed is worth the money. Whatever else Millennials and young adults do in their new apartments or houses, finding artwork that goes beyond the college posters and photos is a big step towards having a grown-up home. Quality artwork can be found in many places, and personal art can be created with photographs printed and framed, rather than tacked to a bulletin board. Leaving behind the symbols of college—Greek letters, college banners—can help to make a young adult's home feel more sophisticated and sleek. Keep the sentimental objects in bedrooms, and make the shared spaces more neutrally comfortable for everyone.